Home › Opinion › Erdogan Regime grasps control of the recruitment mechanism for the profession of law with the cooperation of Metin Feyzioglu. Erdogan Regime grasps control of the recruitment mechanism for the profession of law with the cooperation of Metin Feyzioglu. On the one hand, Erdogan Regime introduces many restrictions on the right to defence and the rights and authorities of the lawyers, on the other hand, grasps control of the recruitment mechanism for the profession of law with the cooperation of Metin Feyzioglu who is the president of the Union of Turkish Bar Association. Since the 2016’s failed coup attempt, many arbitrary and unlawful decisions were given by the provincial bar associations and the Union of Turkish Bar Associations in procedures for admission to the internship of lawyer and the profession of lawyer. Pursuant to the Law No.1136, under the condition of no criminal record, every Turkish citizen who has the bachelor degree in law, has right to be admitted to the internship of the lawyer. But under the state of emergency rule, provincial bar associations refuse the applications by the people who were dismissed of their profession with the decree laws, though there is not any rule that requires or orders it. Cenk Yiğiter who is a doctor of law and was dismissed from the University of Ankara Faculty of Law with Decree Law 679 on 2017 January. When he applied Ankara Bar Association to be admitted to the internship of the lawyer, first was denied on the grounds that the state of emergency goes on and he is a dismissed public servant. When Ankara Bar Association stepped back and accepted his application over substantial public reaction, the Ministry of Justice filed a case against the decision. The legal dispute on Mr Yigiter’s application is not yet over, and this uncertainty violates his social and economic rights such as the right to work. The Arrested Lawyers Initiative is aware of many same cases similar to Mr Yigiter’s. Pursuant to the Law No.1136, everyone who successfully fulfils the internship of the lawyer or serves as a judge or prosecutor for at-least five years, is admitted the profession of lawyer. Judge Murat Ozkan who was dismissed under the state of emergency rule, is denied by the Istanbul Bar Association though he has already got lawyer license. When judge Ozkan’s application was accepted over his administrative appeal, the Justice Ministry filed a case to his license be revoked, and the Ankara Administrative Court revoked his lawyer license. Administrative Courts decides that because of the profession of lawyer is public service, dismissed public servants can’t be lawyer either. Another aspect of the problem is the denial of the lawyer licence although fulfilling the internship of lawyer successfully. Most recently, Mehmet Polat, 23, who graduated the faculty of law while being held under pre-trial detention because of the peaceful protest for Kurdish people, fulfilled the internship of lawyer successfully under the provision of the Istanbul Bar Association and applied for lawyer license on 2017 November. On 7 January 2018, the Union of Turkish Bar Association (UTBA) refused his application in line with the opinion of the Turkish Justice Ministry that suggests Polat can be sentenced in the ongoing cases against him. Mehmet Polat is the member of the Law Office for the Persecuted of which two members have already been arrested. The decision of the UTBA about Mehmed Polat is the clear violation of “the right to be presumed innocent” that envisaged both by the Turkish Constitution and the European Convention on Human Rights. There has been a relentless campaign of arrests which has targeted fellow lawyers across the country. In 77 of Turkey’s 81 provinces, lawyers have been detained and arrested on trumped-up charges as part of criminal investigations orchestrated by the political authorities and conducted by provincial public prosecutors. 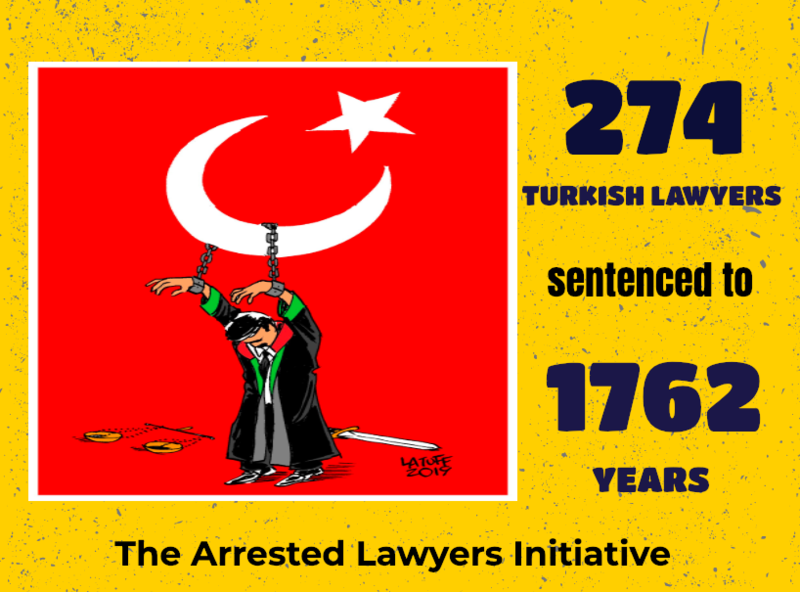 575 Turkish lawyers so far have been arrested and 97 of them were sentenced ranging from 4 to 14 years imprisonment. 14 of detained or arrested lawyers are the presidents or former presidents of provincial bars associations. With the new rules introduced by the decree laws, rights to defence and fair trial were eradicated. Despite the all above-mentioned rights violations, Metin Feyzioglu, president of the UTBA, has been deafening silence; to top it all, he has been cooperating with the Erdogan Regime to legitimise the its unlawful acts and decisions. For instance, on 2017 November Feyzioglu stated -regarding the fourteen lawyers who were arrested on 21 September 2017 because of representing the hunger strike activists Nuriye Gulmen and Semih Ozakca- that I can’t said the evidence against the arrested lawyers is rubbish. Feyzioglu has also said on 2016 February “We do not have definitive evidence of torture” despite the tens of photographs and video published by the state run Anatolian News Agency that proves the coup suspects were subjected to torture.